Cid, our local methano-apocalypse doomer, has been predicting a hydrate destabilization for the last ten years. Is this the sort of doom that is always ten years out like fusion is always twenty-five years out? Cog wrote: Cid, our local methano-apocalypse doomer, has been predicting a hydrate destabilization for the last ten years. Is this the sort of doom that is always ten years out like fusion is always twenty-five years out? Nope. It's happening as you type, head firmly planted up your...... in the sand. Happening as you type? Check the weather in the region. Dickson Russia -30F Tiksi Russia -26F, Pevek Russia, -18F, Pt Barrow Alaska -10 Gjoa Haven Canada -36, Thule Greenland -17F= Average -22F .There isn't any thawing going on today. Since I am another local meth doomer, I can show you the links to where it all is going, into thin air. Just like our worldwide unsustainable economy it takes time to collapse and end, thank God. I do not think we will go extinct within a few decades but there will be less and not more people. Peak humanity around 8 Billion or so. Last edited by Whitefang on Tue 29 Jan 2019, 14:04:51, edited 3 times in total. Yes, VT, as you show, any idiot can take a snapshot of current temperatures to avoid acknowledging the ongoing trend of warming. Yes and any idiot can fail to see that the winter average has been -30 F which means there are 63 degrees F to go before you have winter season melting. Last edited by vtsnowedin on Tue 29 Jan 2019, 15:02:31, edited 2 times in total. 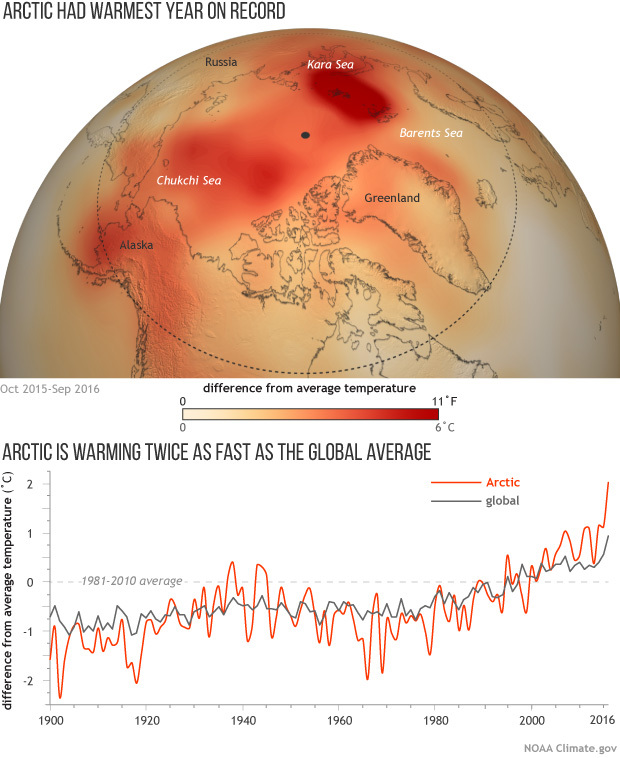 What is the reason that the Arctic is warming much faster than the lower lattitudes in simple terms? Is that what they call 'Arctic Amplification'? jedrider wrote: What is the reason that the Arctic is warming much faster than the lower lattitudes in simple terms? It is still being debated. Taylor's research shows that the seasonality of the polar warming is largely a result of energy in the atmosphere that is being transported to the poles through large weather systems. The importance of energy transport in the warming of the poles suggests more study is needed on the interactions between large weather systems and more local changes, involving clouds, water vapor, surface albedo and atmospheric temperature, in order to better understand climate sensitivity. "We hope to learn more about the processes involved in atmospheric processes in order to better understand what climate models are telling us," Taylor said. Base line on the above data is very recent, already abruptly changed, heated up. Better based on the changes from the average last century or so. Yes still below freezing H2O but it is the extremes that matter, rain events on the pole, summer sea ice exit, those happening will push the Arctic climate out of balence and once it is far enough from normal it is impossible to return to the stable state. Until a new state, hothouse without ice, the end of ice. There might be discussion on how fast it, AAmp. is going faster but the causes are known, all those feedbacks upon feedbacks, albido/methane/jet/PV/snowcover/currents…...the pole is the weak link in the stable climate we used to enjoy. Well, I guess that's the answer I was looking for. Rather simple than complicated. In the tropics—fueled by high temperature and moisture—air can easily move up to high altitudes, meaning the atmosphere is unstable. In contrast, the Arctic atmosphere is much more stable with respect to vertical air movement. This condition enhances the CO2-induced warming in the Arctic near the surface. In the tropics—due to the unstable atmosphere—CO2 mostly warms the upper atmosphere and energy is easily lost to space. This is opposite to what happens in the Arctic: Less outgoing infrared radiation escapes the atmosphere, which further amplifies the surface-trapped warming. Thanks for the links to new findings on AA, what is rarely mentioned is all those extra Gtons of methane in the mix on top of the world. Just watched the whole video of the end of ice, at 16 min they talk on that guy and how to take the bad news, so many people waking up now and trying to do their best, be excellent, impeccable. Looks like Dahr and Thom Hartmann accepted abrupt CC, what it means and try to make it into something positive. AFR, American Freedom Radio, no fear of doom, no rules, no taboo, Carol Rosin. After listening to this ep with Dr David Suzuki, you’ll never be the same again. The environmentalist, activist, professor of genetics and science broadcaster hits us with some home truths about what our future will look like if we continue to live the way we have been. What will life be like for our children and grandchildren? Can the damage we’ve done to the planet be reversed? Is extinction of the human race imminent? We talk about population control, the importance of renewable energy and discuss what we can do right now in our own lives that can actually make a difference. This is for anyone who cares about the future of mankind. 36:26 Can we be saved from our own extinction? Tim Bob video of Guy and others last November, dealing with the data. Fine talk. 35% reduction of Industrial activities, about 1 degree warming within weeks, not months or years, let alone decades or more. Even extinction Rebellion does not talk about the big D, Global Dimming…...they want, hold on to hope if we just curb everything then we still have the option of returning to an ice age. Meth doom at the end. The unrelenting increase in global levels of atmospheric methane went literally off-the-charts used to display methane for the Copernicus Atmospheric Monitoring Service (CAMS). 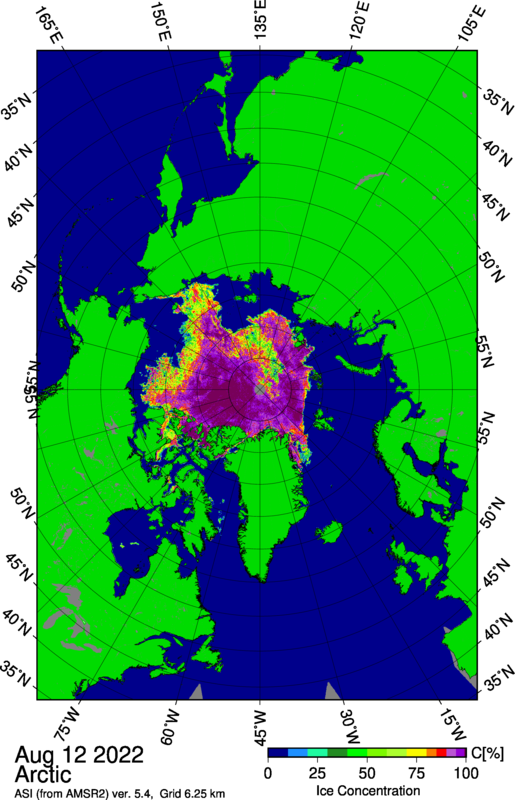 Methane levels were so high that they swamped out the colour scheme used in the map legend, causing saturation in large red blobs with little detail. The colour legend was shifted by 100 ppb to more clearly show the detailed structure of where methane was being emitted. All life on Earth, domino effect after fastest abrupt CC ever, 1000 times the previous fastest one, the great dying. Climate change and human activity are dooming species at an unprecedented rate via a plethora of direct and indirect, often synergic, mechanisms. Among these, primary extinctions driven by environmental change could be just the tip of an enormous extinction iceberg. As our understanding of the importance of ecological interactions in shaping ecosystem identity advances, it is becoming clearer how the disappearance of consumers following the depletion of their resources — a process known as ‘co-extinction’ — is more likely the major driver of biodiversity loss. Although the general relevance of co-extinctions is supported by a sound and robust theoretical background, the challenges in obtaining empirical information about ongoing (and past) co-extinction events complicate the assessment of their relative contributions to the rapid decline of species diversity even in well-known systems, let alone at the global scale. By subjecting a large set of virtual Earths to different trajectories of extreme environmental change (global heating and cooling), and by tracking species loss up to the complete annihilation of all life either accounting or not for co-extinction processes, we show how ecological dependencies amplify the direct effects of environmental change on the collapse of planetary diversity by up to ten times. Being in the midst of the sixth mass extinction1, it is fitting to quantify the relative contribution of different mechanisms driving catastrophic biodiversity loss. Drivers directly related to anthropogenic modifications of the biosphere are apparent and well-described: habitat destruction, over-exploitation, and biotic invasions2. Similarly, the effects of environmental change (e.g., temperature rise, increased droughts, ocean acidification, et cetera) can be easily interpreted — when the environmental conditions of a certain locality become incompatible with the tolerance limits of inhabiting species, in many cases these will go locally extinct, just like fish in an aquarium with a broken thermostat (even if there are counter examples of species that have been capable of rapid adaptation to novel environmental conditions3). Yet, there are other, more complicated mechanisms that can exacerbate species loss. In particular, it is becoming increasingly evident how biotic interactions, in addition to permitting the emergence and maintenance of diversity, also build up complex networks through which the loss of one species can make more species disappear (a process known as ‘co-extinction’), and possibly bring entire systems to an unexpected, sudden regime shift, or even total collapse4,5,6,7,8,9. This makes it difficult to be optimistic about the future of species diversity in the ongoing trajectory of global change, let alone in the case of additional external, planetary-scale catastrophes. A previous study14 contended this idea by using the remarkable tolerance of tardigrades to extreme temperature, pressure, and radiation as a reference to calculate the likelihood of global sterilization on an Earth-like planet following different, dramatic astrophysical events. The stunning conclusion of that study is that life on our planet has the potential to survive asteroid impacts, supernovae, and gamma-ray bursts14. This ostensibly reassuring news highlights how some scientists still tend to disregard the role of co-extinctions within collapsing communities in driving global biodiversity loss, while focusing on individual species’ tolerance limits as the only criteria relevant to species survival in a changing world. Ecologists know the optimism is not supported quantitatively, but can we estimate the magnitude of the bias? Here we attempt to do this by combining real-world ecological and environmental data to generate several virtual Earths populated by interconnected species-interaction networks where we allow species to move and adapt, that we then subjected to extreme, global environmental change. By comparing scenarios of extinctions based only on species’ environmental tolerances with others accounting also for co-extinctions, we show that neglecting to consider the cascading effect of biodiversity loss leads to a large overestimation of the robustness of planetary life to global change. Oops, I meant tardigrades, just not read the whole intro and wondering about trilobites…they were ancient life now well down under lots of Earth right? Walking away from Guy McP. Look at how much attention from HS this Guy gets from just venting the truth. That alone should set off your alarms. - thoughts about "deep state"
Here's a critique of many of McPherson's arguments. His near-term extinction scenario seems mostly based on the theory that abrupt warming in the Arctic ocean will inevitably trigger a sudden massive methane release from the East Siberian seabed. However, I read somewhere that these methane clathrates are dozens or even hundreds of meters deep under the seabed and that any extra warming of the ocean, however dramatic, takes many decades or more than a century to penetrate so deep into the seabed. Fredrik, you need to read the many threads of Runaway Global warming on this site. In them you can peruse the many commentaries from Cid Yama synthesizing what some scientists are saying is happening in the East Siberian Arctic Shelf. Suffice to say we are talking about a substantial amount of disassociated methane just below the permafrost in danger of being released because this permafrost is melting under current conditions there. onlooker wrote: Fredrik, you need to read the many threads of Runaway Global warming on this site. In them you can peruse the many commentaries from Cid Yama synthesizing what some scientists are saying is happening in the East Siberian Arctic Shelf. Suffice to say we are talking about a substantial amount of disassociated methane just below the permafrost in danger of being released because this permafrost is melting under current conditions there. I remember the panicked talk about an imminent large-scale methane release in 2011, after the Semiletov/Shakova report with the huge methane plumes and the oft-quoted 50 gigaton scenario. So far, methane levels have only risen by a few percent since, despite record warming in the Arctic. Most climate scientists seem to expect a similar slow increase of methane from the Arctic region during the decades to come. And the subsea permafrost has been slowly thawing for millennia after the East Siberian Arctic Shelf got inundated, so this theoretical threat of 50 gigaton release has been there for maybe thousands of years. IIRC, the thaw now reaches several dozens of meters deep, so any additional heat from the warming waters takes quite some time to permeate deeper than that. Plus .8 degrees at 80.08 degrees NL! Free of ice I suppose. Minus 3 degrees Celcius at the Bering Sea, still freezeng, around minus 8 at the Northpole. Once the cold blob on the arctic ocean is split up, between Canada and Russia, it will be hard for the relic sea ice to form and stay intact. Barentz sea almost complete free of sea ice, large gap North of Spitsbergen, arctic turning into atlantic regime, an abrupt regime change of the climate. Guy is saying we should pay attention and live with death in mind, be excellent every day and night as if it is your last little dance on this Earth, this magical place, he is telling we should brace ourselves for this change will speed up with the absence of our dirty global shield, Global Dimming or the loss of sea ice that will probably plunge us into a hothouse. Even without abrupt CC, it is really better to stop living as if we are immortal beings, let death be your advisor every moment, to let you make the best decision before you act like a petty tyrant and hurt yourself and others around you. Heck, I am an optimist, I think we are not as stupid as we do, think we are. I think we are misled which is not an excuse or judgement. This is bound to go boom blast, not a happy ending. Last edited by Whitefang on Sun 03 Feb 2019, 15:01:48, edited 1 time in total.